The Xenu article on Wikipedia has passed its Featured Article Review unanimously, meaning that it has been confirmed to meet the encyclopedia’s highest standards of accuracy, comprehensiveness and neutrality. This is after a thorough overhaul and check of references on which it is based, in which I’m proud to have played some part. Get your fact-checked info on Xenu here! Then quake in fear at the prospect that Xenu might once again bring his awesome nuclear justice back to this planet. The amazing anti-Scientology video work of Pelvidar is back! With outstandingly creative use of archive material and effects, Operation Fair Game: STOP hilariously debunks the claim that Anonymous wear masks to “intimidate”. 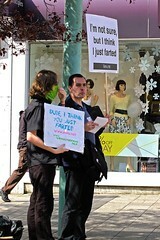 Our own Damian is visible just after the twelve minute mark, in the Plymouth protest. As commenters on Enturbulation have suggested, these films are, hopefully, history books for the future. Via the Guardian, the Register and a bunch of other media outlets including BBC London local news (below), the story of how City of London Police are trying to ban the word “cult” from anti-Scientology protests. UPDATE: there will be no court hearing – Total failure for the cult of Scientology! More details below the fold. We joined the Birmingham protest which was part of Operation Reconnect: the third global protest organised by Anonymous, who turned out in force with wonderful costumes and delicious cake. I was interviewed by the Birmingham Mail and on Monday published an article on Birmingham Indymedia about the protest. I’ve already banged on about it a lot, but the Anonymous versus Scientology war really is the most interesting thing going on in online culture right now. This 15-minute film, “The Road to 10th February 2008”, spends the first half giving the background to Scientology versus Anonymous, then the latter half showing the awesome scale of the worldwide protests, and the official Scientology response claiming to be under attack from a “terrorist group”. I’m pleased to say that two of the still images used for the London protest are mine. 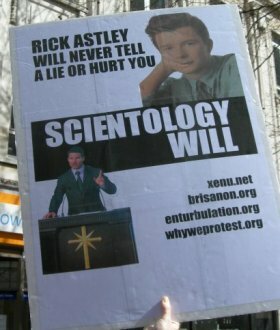 Meanwhile, ChanologyASSIST hilariously uses Rick Astley to show how Anonymous has given up its hacking techniques in favour of peaceful protest, and another Anonymous member announces “Operation Reconnect”, a counterpart to Scientology’s Disconnection policy. Leaked information from within Scientology suggests that the protests are having an effect, and that the organisation is still planning its counter-moves.